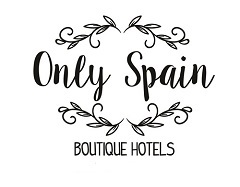 This is a lovely little hotel with just six rooms up in the narrow, winding streets of the Albaycin area of Granada city. The main entrance opens onto a pretty, traditional flower-filled open air patio. The bedrooms are around the patio with terrace views and window boxes. It’s a lovely spot for an al fresco breakfast in summer. We ate breakfast out on the terrace at 8am at the end of May, the start of a very warm and exciting day of exploring the city. Ten out of ten for breakfast and twenty out of ten for noticing it was my birthday and leaving this in our room when we returned. This charming, well-run small hotel, which I liked very much, is not for those with walking difficulties. Steep, cobbled streets lead up to the hotel. There is nearby car parking at a cost. We took backpacks for ease and enjoyed finding our way around the back streets. Our room was very nice with views onto the patio. As an overnight or two stay in the city but away from crowds in a peaceful situation it’s ideal. Or to book immediately go to La Posada de Quijada on Booking dot com. Read about our visit – 36 Hours in Granada on my Luxury Spain Travel blog.